We are finished week 19 of the MLB schedule and the Blue Jays appeared to be locked into 4th place with 2 months to go in the season. The trade deadline has now come and gone and the bullpen looks vastly different with Aaron Loup, Roberto Osuna, Seunghwan Oh and John Axford all snapped up by contending teams. In their place are new closer Ken Giles and free agent singing Mike Hauschild, who was outstanding in 6 innings of relief Thursday. Here are ten random thoughts from week 10 of the MLB. 1. I'd like to start things off this week talking about my experience at my first MLB game. First off, overall it was a great fan experience for me. The Mariners had a wonderful usher working my section. She went out of her way to make me feel welcome and she helped me uncurl my sign and took some photos of me in my seat with my phone. The seats were awesome and we all had a great time yelling "Let's go Blue Jays" and competing with the Mariners fans in our section to be the loudest and proudest. The food was pretty good. I had the fried grasshoppers, a burger and fries and a soft pretzel with nacho cheese sauce. I enjoyed the burger, but found the fries to be oversalted. The grasshoppers were heavily seasoned in the lime-chili spice they used. I don't think I would order them a second time, but I enjoy trying new things. The soft pretzel was yummy, but the nacho cheese sauce was pretty typical of what you get at a movie theater or Taco Time, nothing special. My one criticism from my experience would be the cleanliness of the washrooms. I used the facilities on my way out of the ballpark and the sinks were disgustingly dirty. My bathroom stall had toilet paper and it was stacked on top of the dispenser instead of being inside of it. Other stalls had no toilet paper at all. I met some amazing people before and during the game. I only went the one day. Maybe next time I'll go a day early and explore Seattle a bit more. 2. On Tuesday, the Blue Jays said goodbye to their longest serving member as sidewinder Aaron Loup was traded to the Philadephia Phillies for minor leaguer Jacob Waguespack. As a Blue Jay, Loup had a 12-20 record with a 3.47 ERA in 369 appearances. Loup has always been a reliever, pitching one or two innings max. In recent years, he has had reverse splits, where his numbers have been better facing right-handed batters. Loup has made one appearance for the Phillies and he hit the only batter he faced. 3. Also on the move at the trade deadline was reliever John Axford, who was traded to the LA Dodgers for minor leaguer Corey Copping. In 45 appearances for the Blue Jays, Axford had a 4-1 record with a 4.41 ERA. He had a very rough debut for the Dodgers giving up 6 runs on 3 hits and a pair of walks. He'll have to earn his new manager's trust before being put in a situation where the game is tight. 4. The Blue Jays also signed free agent Mike Hauschild, who was recently released by the Houston Astros. Hauschild threw six strong innings of 4-hit ball to keep the score tied until the bats woke up later in the game. It's possible the Blue Jays could try him in the starting rotation next time. I mean, he can hardly be worse than Jaime Garcia or Sam Gaviglio. 6: Losers of the trade deadline: Atlanta Braves (traded for Darren O'Day who is out for the season with a hamstring injury;) Milwaukee Brewers (did not add a starting pitcher; instead traded for Jonathan Schoop, who plays the same position as 2B Travis Shaw; so you either take Shaw's bat out of the lineup or you shift Schoop to SS and make your defense worse); Houston Astros (traded for girlfriend beater Roberto Osuna, who can be a solid reliever or really, really bad); Chris Archer (was dealt to penny pinchers Pittsburgh Pirates after playing for penny pinchers Tampa Bay Rays). 7. The Blue Jays received good news on the injury front as Marco Estrada, Kevin Pillar and Danny Barnes all made their returns from the disabled list this week. Estrada's first start didn't go great as he only managed to get through 4 innings and gave up 4 runs on 5 hits while walking 3. He started again Saturday and . Danny Barnes threw an inning Wednesday and gave up a single and walked one. Kevin Pillar was 0-3 at the plate, but picked up an RBI on a sac fly. He looked fine in the field and luckily wasn't forced to make any diving catches that might have tested the SC joint injury. 8. Saturday was the 25-year anniversary of Nolan Ryan infamously beating up Robin Ventura, who charged the mound after Ryan plunked him on the shoulder. Have a read on the events that led up to this beat-down. 9. Will he or won't he? A report came out Saturday that LA Angels manager Mike Scioscia plans to step down after the 2018 season ends. His contract is expiring after this season and the Angels have been in a pretty bad tailspin since 2009. They have had massive injury issues with enough players on the DL to form a team. Scioscia denied the report Sunday. It might be an interesting off-season for the Angels who may be replacing a legend as manager. 10. 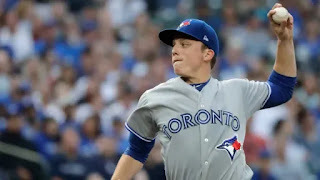 Blue Jay of the week: Ryan Borcki who had a strong 8 inning 4 hit performance on Saturday vs. the Mariners. The rookie phenom seems like a lock for the Blue Jays rotation next year.